This entry was posted in Careers & Networking, Film, Screenwriting. Bookmark the permalink. So you went to the movie theater or rented a DVD and saw another terrible film with predictable characters, no plot and horrible acting? Instead of complaining, use your frustration to become a screenwriter and write the movie you want to see on the silver screen. Right now, the only thing preventing you from being a famous Hollywood film writer is coming up with a screenplay. The rest is just mechanics. First, go to the nearest library or book store and browse through the screenwriting section. After you get over the initial shock of how many books there are, pay close attention to any books by paid, famous screenwriters such as Syd Field (one of the industry greats). Be sure to ask for Syd Field’s Screenplay or David Trottier’s The Screenwriter’s Bible. 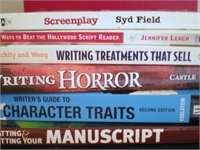 These standards and similar books detail screenwriter tips and methods, screenplay formatting and submission recommendations. Sure, I know what you’re thinking, “I haven’t even started writing yet and already I’m buying all this stuff?” In the screenwriting world there are very strict standards for font size and typeset, margins, spacing, directions, character labels and much more. If you try to use word processing programs to format your screenplay (as I did) you will be sorely disappointed and really frustrated. Instead, buy one of the industry-standard screenplay programs (such as Final Draft) and let the program do the nit-picky detail work for you. All the time and effort you save by using one of these programs can be applied to writing your screenplay. Now that you know how to write your screenplay, you need to brainstorm about ideas. Although this may seem like an easy task, once you start the process you will understand where the term “writer’s block” comes from. One of the most difficult tasks you will face as a screenwriter is coming up with original ideas that have enough rising conflict and character interaction to fill two hours of screen time. To help you brainstorm, ask yourself “what if” questions about subjects you are interested in. This may lead to some great ideas and help you build a story. After you have a story idea, create your characters. Be sure to create “back stories” for all main characters, including their age, family, likes and dislikes, fears, goals and desires. The more you develop your characters, the easier it will be to give them dialogue and actions to help your film come to life. Make note cards for each character to keep them distinct from one another and jog your memory about their particular flaws or strengths. After you have the greatest film idea and characters of all time, you actually have to sit in that chair and write. If your brainstorming was thorough, you should know the basic history of your characters and a rough outline of the difficulties they need to overcome before the movie ends. Develop each scene with a specific goal in mind, such as Joe finding the serial killer’s hideout or Jane overcoming her fear of heights. Write every day, for as long as possible, without editing. When the first draft of your screenplay is finished, print it out and put it away for a week, to let it “rest”. After the week is up, take out the rough draft and read it all the way through, making notes on the pages or margins. Then read it again, from end to beginning (yes, backwards) checking for spelling and grammar errors. Finally, sit down in that chair again and make the necessary corrections from your notes. When you are done, print out your “final draft” and relish the deep satisfaction that only comes from finishing a big project. Now that you have a polished, final-draft screenplay in your hand, get a copy of The Writer’s Market for the current year and start choosing agents. Although many agents will not accept full screenplays, you may submit letters to them with a short description of your movie, approximately 20 words long (logline). If they like your idea, they may ask for several pages or scenes. After review, they will decide whether or not to accept you as a client. Finding an agent can be very difficult (it took me years), but it is one of the best ways to get your screenplay purchased by a director or production company. If you can’t find an agent to represent you, carefully choose a few production companies to submit your screenplay to. Although many companies and directors will not accept submissions from unrepresented screenwriters, you may find a few who will. However, after submitting your screenplay, be prepared for a long wait. Even if you submit your screenplay online, review times can vary from two weeks to six months. Mailed, hard-copy submissions (paper) take even longer. Whatever you do, keep writing and never give up. Join online screenwriter communities, subscribe to writer’s magazines, take some college classes and watch every movie you can get your hands on. The more you know about the industry, the greater your chances of becoming a paid film screenwriter. Good luck! How many female screenwriters are registered with the Writers Guild of America?